We thoroughly enjoyed Putu sharing his beautiful island of Bali with us! He arranged our tour to what we wanted to see and do during our entire day visit! We thoroughly enjoyed the monkeys at the Sangeh Monkey Forrest, lunch visit at Uma Luang Sari - delicious local lunch with a spectacular view overlooking the rice fields. Enjoyed our Luwak Coffee tour and tastes; visited villages, learned about the Bali culture, visited UNESCO Jatiluwih Green Land and the Temple Tanah Lot. Awesome day! I had very limited time in Bali so I got in contact with Putu, who provided me with a fantastic itinerary giving me insight into Bali's culture & attractions, where I felt I had experienced the best of Bali & had been there longer. Putu is very professional, organised & I felt relaxed and excited about my day trip adventure. He's got a great sense of humour & is very knowledgeable. Provided me with such great memories travelling around exploring sights I had dreamt of seeing. Best tour guide!! Very helpful guide, knowledgeable and excellent driver. We had a very interesting day with Putu touring two of the Island's temple sites. We had a fantastic day with Putu. Very experienced and knowledgeable. We felt very safe with him. He took us to an amazing hindu temple where masses of Balinese hindus were lining up to wash their sins away. We visited a coffee plantation to taste various teas and coffees and to experience the famous Luwak coffee. My wife who never drinks coffee even enjoyed the tastings. We visited the king's palace and dressed in traditional Balinese clothing. Wherever we went Putu was able to answer all our questions. Putu was an excellent guide. He knew we were on short time and planned the tour accordingly to show us as much as possible. His English is excellent and he gave us good descriptions of the things we saw. He also was able to tell us a lot about Bali and the people, history and culture of the island. We highly recommend Putu. Putu was everything we could have asked for! He has a wealth of knowledge about the island, it's history, and the people. He loves Bali and it shows. He was flexible, helpful, and fun to be around! When we come back, or recommend friends to visit Bali, we will only think of Putu as the guide everyone needs. TOUR GUIDE RESPONSE: Dear Katie Thank you very much for the 5* rating and great review. It has been honor to meet you and your husband. I look forward to meeting you again in near future. Thank you Best regards Putu K.
We loved travelling around Bali with Putu K. He is a warm, nice person who showed us many things that we wouldn't have found without him. We especially enjoyed the coffee and tea tasting near the end of the day that gave us the energy to finish the day. We highly recommend him as a guide. We would highly recommend Putu to anyone who would like a personalized tour of Bali. He was very knowledgeable and answered all our questions. He took us to many interesting places and explained all about the customs and culture of the Indonesian people. He was great! We had a great tour with Putu. He showed up on time. He was very knowledgeable answering all our questions. He took us to many very interesting places and explained everything to us about the places and also gave us insight into the customs and culture of the Indonesian people. He was very laid back and willing to take us where ever we wanted. HIs English was very good. We would highly recommend him. Putu was an excellent tour guide under very trying conditions. It poured rain for two days--so much so on the second day that we cancelled the tour. The first day we managed to see some magnificent temples and the UNESCO heritage site of the great-rice terraces. We lunched at a restaurant overlooking the terraces--beautiful. Putu provided interesting commentary along the way and made a nice unscheduled stop at a coffee/tea plantation. Nice ending to a trip to Bali. Thank you Putu for the great overview of Bali. This was our first visit to your beautiful part of the world, and we were fortunate to have you show us around. Your friendly and professional guide service really added to our enjoyment of Ubud Bali. Our visit to the Monkey forest was incredible. We covered so much in our one day with you - again, thank you Putu. Our guide Putu was excellent and flexible. He chauffered us around Bali for the day and showed us everything that we had asked to see. He was extremely knowledgeable and courteous and willing to add or subtract sights or stop on the way at something that we decided was interesting. His SUV had ample room for the 6 of us and was clean. We booked this off of a ship and he returned us to the ship in plenty of time . This was my second tour with Putu and it was wonderful! My chef friend and I happened to be back in Bali for an additional day and Putu was able to accommodate us on very short notice spending another fantastic day with us! Putu added his personal touches to the tour, recommending fantastic food stops along the way (as he knew we are voracious foodies).... We enjoyed, absorbed and immersed ourselves in the fabulous culture of Bali. What a great time! I really enjoyed my time with Putu and I would highly recommend him for any tours of Bali. I had a fantastic time with him, he is very easy going, personable and kind.... really the perfect guide for a newbie to Bali. I'm in the food business and Putu recommended some incredible food stops which were truly amazing. Putu really went the extra mile to make sure I had a great day. Thank you Putu!! Putu was a fantastic guide for us on our day in Bali. He was exceptionally flexible. We still saw the sites that were part of the tour, but he was flexible to allow us to do a few other things as well as a bit of shopping. I would highly recommend using him during your visit to Bali. the tour was great and would recommend it. Good customised itinerary covering history & culture of Bali. Good time management, safe & comfortable driving. Putu is an excellent guide. He speaks good English and took the time to explain culture things I was interested in learning about.Putu also knows where to go and how to navigate and avoid some very heavy holiday traffic. I am recommending Putu to my daughter and her husband for their honeymoon trip to Bali in February. I highly recommend him for Your holiday as he is a wonderful guide. He always give us descriptive explanations of the stops we headed to and what's the meaning behind them. His service is also wonderful and would always help us answer our queries. All in all, I think he is a wonderful guide. Nice guy, good guide and loves his homeland. Very informative - highly recommended! Was very disappointed with the tour as so much time was spent in traffic which should have been explained at the start by the guide so we could have decided to alter our arrangements. Also very pricy. Putu was an excellent guide - showing us the Bali we wanted to see with his customised tour for us. Rice terraces, the countryside, small quiet villages, a kite making and silver shop. He was punctual, very pleasant to spend 6 hours with and very knowledgeable. He was very open telling us about Hindu customs and festivals and we appreciated learning more of this religion (at our asking)Our family of 6 aged 7 to 70 has a wonderful day and especially the children got a better perspective of Bali life. I hired Putu for 23 and 24 August, 2016 to show me around Bali. Having never been there, Putu was careful in putting together a custom tour based on email conversations we had in advance. Was on time, not rushed and I would highly recommend! Putu was prompt at the appointed pickup time at our hotel. He modified the tour to our requests and my wife's lack of mobility. The traffic was horrid which took away from some of the quality of the tour agenda-which was not in Putu's control. I have no reservation in recommending him. Our day spent with Putu was the most informative and pleasant day we spent while in Bali. We would highly recommend any tour that you can get with Putu as your guide. He has a fantastic knowledge of the island and a great personality as well! We had arranged our tour of Bali with Putu many months in advance. Putu met our group of four (wearing traditional Indonesian clothing) promptly at the cruise ship pier, and wisked us away in his comfortable, air-conditioned SUV. We visited wood carvers, batik factories, and interesting gemstone creations. We also visited the rice fields around Ubek, and visited the market. It was a wonderful day, and Putu is an excellent guide. This tour is highly recommended! We had a wonderful tour with Putu. He was very knowledgeable and helped us customize a tour. Great experience. I would highly recommend him as your guide. Putu was a very knowledgable tour guide. Would definitely recommend and use again. Our second time doing a tour with Putu and excellent service all round. He went out of his way to be sure that our group was happy -- we needed to split the group due to time constraints and he made that happen. Part of the group rafted the Telaga river (awesome!) and part of the group did tours of Tanah Lot and the royal temple. Absolutely recommend both parts of the tour. We did the Ayung river the first time -- both rivers are good fun. I give it five stars out of five. Putu was wonderful! I highly recommend Putu and Tours by Locals to everyone. We had a great tour in Lombok. The guide was prompt, courteous, and very knowledgable of the area. He took us to beautiful sites. His car was large and clean and comfortable, with good air conditioning. We give him a 5 out of 5. Superb! Putu was so great with our group of 13 people with diverse dynamics and interest. He is knowledgeable,fluent in English, humble and very patient. Putu went beyond our expectations in planning our trip. He proactively worked and meticulously planed to make sure our group's tour, vegetarian meals and leaving requirements were met beyond our expectation. Putu has in depth knowledge of Bali culture and history. Putu is number one on my list for recommending airport to airport worry free Bali visit. We enjoyed the whole trip with Putu, he took care our family well throughout the whole trip. We especially like the river rafting at ayung river the most.The nature scenery was beautiful and the kind and playful instructor made the rafting exciting, fun and full of laughters. Putu is highly recommended to anyone visiting Bali in the future. We felt that the tour was a great value and his six passenger van was comfortable, clean, and cool. He drove safely through Bali and enabled us to visit all the sites originally on our tour, even though we arrived late. He provided water and was very professional. He even saved us money by taking us to an ATM without fees! Four Americans and two Australians - he answered all of our questions and got us back on time. A wonderful day! Putu gave a great tour. He is extremely knowledgeable, easy going, and great itinerary for our needs. We would highly recommend him. He did meet our requests when we insisted he take us where we wanted to go. He gave us a hard time with our requests. TOURSBYLOCALS RESPONSE: This is the first 2 star of Putu. We have asked further details to Mario but we did not receive any reply. Simply perfect in all aspects! Putu is a good driver and is very reliable with reasonably good english skills. His car was clean and air conditioned. Putu was very flexible and gave us an outstanding tour! As this 8-hour tour was the second day we spent with Putu, since our ship in Benoa was docked overnight, my wife decided that she wanted to spend more time shopping than sightseeing. Putu took us to several nice shopping venues, including jewelry, art, mask and figure carving, and the indoor/outdoor market in Ubud. He was very helpful in guiding us to high-quality vendors. 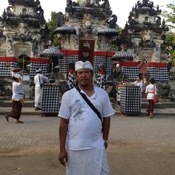 We hghly recommend Putu to anyone seeking a knowledgeable guide in Bali. Putu met my wife and me at our ship in Benoa, Bali as we disembarked, and escorted us to his clean, well-maintained AIR CONDITIONED vehicle. We then took off on an 8-hour tour of parts of southern Bali. As our ship was to be docked overnight, we had also booked an 8-hour tour with him the following day. We found Putu, who spoke very good English, to be an excellent guide and very knowledgable about the island. We wholeheartedly recommend him if you are seeking aguide in Bali. we used putu for a cruise ship tour. our itinerary changed due to weather issues, and communication with putu and tours-by-locals to re-arrange booking was excellent. putu was a very good guide. we felt very safe and well taken care of. as to the tour, I would skip Ubud as way to touristy, but the rest of the day was wonderful, ending with a lovely dinner on the beach. highly recommend putu for a full day Bali experience. Putu was a very informative guide who gave us a great day, he made sure we saw as much as possible that we wanted and got us back to our ship in plenty of time. I would recommend and use Putu again. Putu was our guide for my family of 13 ages ranging from 5 to 75 yrs.He is very knowledgeable on the local history and culture, never fails with any queries we threw at him.He also proved a very reliable and responsible gentleman.Always prompt and accommodating.Highest recommendation. We were fortunate to have booked Putu for 3 days--2 starting in Benoa and 1 starting in Celan Bawang. Putu is very knowledgable, reliable, flexible and accommodating. His local contacts and driving skills were excellent. Whether hiking to waterfalls, enjoying religious sites, parks, rice fields, or local culture he was an excellent source of information and a joy to be with. We recommend time with Putu wholeheartedly. You will have a great diversity of experiences tailored to fit your preferences. Putu did our first day with us as a customized tour starting in Celan Bawang. He arranged to drive across Bali to meet us at the Port. We had a great day. While not his primary guiding area Putu arranged a very interesting day combining some gentle hiking to a waterfall with a variety of cultural, religious and other sites. He explanations and knowledge base are excellent. The 4 of us had a great day. We met up again 2 days later in Benoa and enjoyed additional tours with Putu. We recommend him highly. I recently travelled to Bali for a short visit on my way to Australia. With so little time available to explore the island, I decided to hire a private tour guide. There were some specific places I wanted to see, but I didn't have time to research. Based on my preferences, Putu put together a fantastic personalized tour that covered everything, and more than I could possibly cover by myself. He was punctual, flexible with the itinerary, insightful and informative! A very memorable trip! Thank you! TOUR GUIDE RESPONSE: Thank you for your great review. Look forward to welcome you again in near future Regard Putu K.
If you are in Bali this is the guide to choose, Putu has a lot of knowledge of Bali and everything that it has to offer. Putu put in extra effort to make our trip one to remember. Thank you! We felt we had an accurate and rewarding tour of Bali. We were keen to have an understanding of what has made Bali unique and we felt Putu was able to deliver the experience we asked for over our two days with him. He was very pleasant and engaging and had a flexible attitude about our wishes and was able to accommodate to our tastes very nicely. At the end of our time we felt we had some insight into the Balinese ways of life and had made a friend. He was completely forthcoming in his responses. We had a thoroughly good day. Putu proved to be a most reliable and informative guide and provided flexibility tour to meet our wishes. Another great tour with Putu, a careful driver and reliable guide, will easily adjust the program to fit your needs. Highly recommended. TOUR GUIDE RESPONSE: Thank you, Marco. Glad to have you on board. Hope to see you again on your next vacation in Bali.